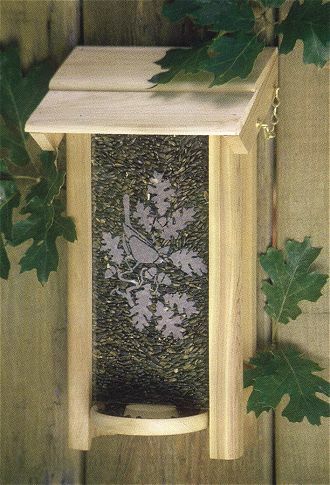 We are now offering the beautiful Songbird Wall bird feeder with a new hand etched original design by Gary Schrodt. The Cardinal is handsomely nestled in Oak leaves. These bird feeders make a lovely housewarming present, working particularly well in new neighborhoods that have a shortage of trees. The lid of these bird feeders tilts forward for easy loading and is held in place by an attached pin. Holds 5 cups of seed.